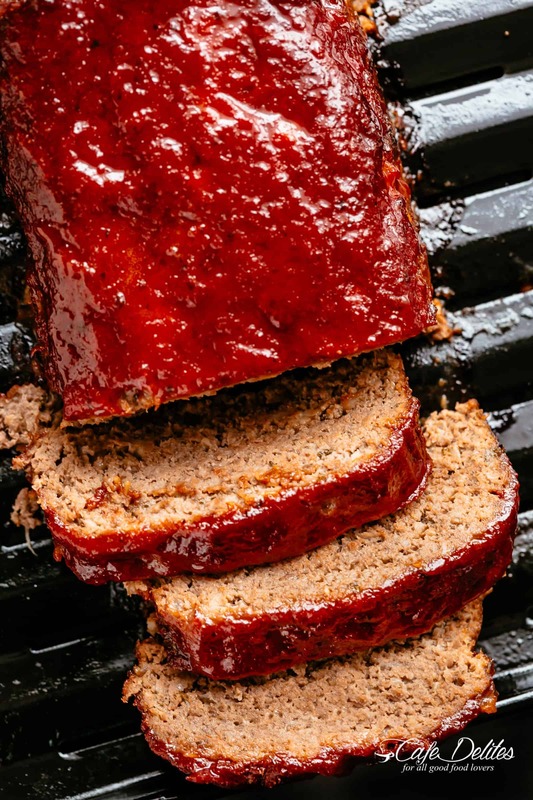 How to make the best tender and juicy Meatloaf with a delicious shiny glaze! Cheap, easy and quick to prepare, let the oven do all the work for you! 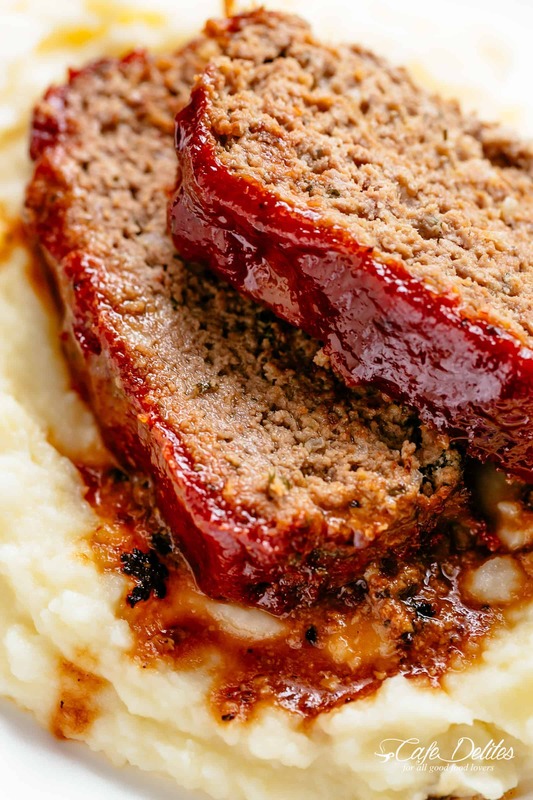 Look no further for the best Meatloaf recipe because it’s right here! Juicy and flavourful on the inside, with a caramelised shiny glaze on the outside makes this classic Meatloaf a winning centrepiece on any dining table. The whole family goes crazy over each slice! PLUS… take advantage of leftovers and turn them into the best meatloaf sandwiches! Meat lovers…rejoice! 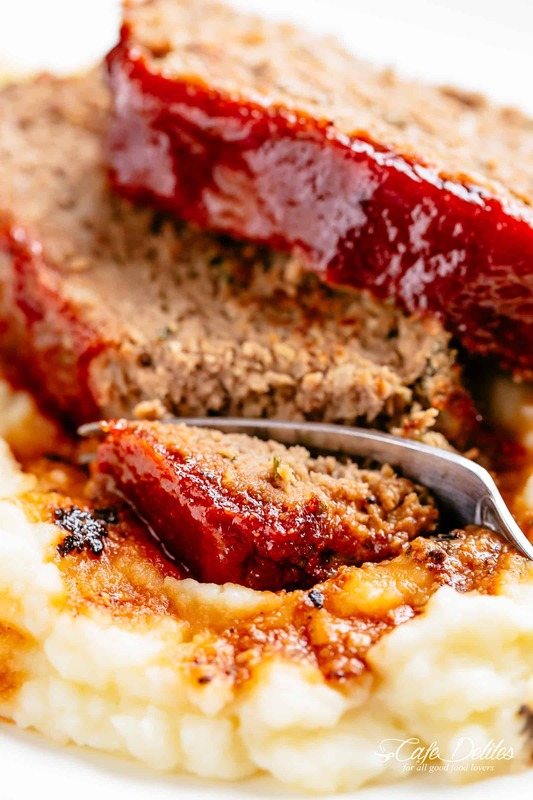 Finally, a meatloaf recipe that is guaranteed to come out perfectly juicy, NOT dry, hard, chewy or tasteless. All dreams come true when slicing into this loaf. What better way to serve a thick slice of Meatloaf than on a pile of creamy mashed potato OR mashed cauliflower for a lower calorie idea! Mix any remaining sauce with leftover pan juices, then pour that sacred juicy sauce ALL over your meatloaf! Instead of using breadcrumbs, we use bread slices soaked in milk which is what guarantees a juicy, tender loaf. You see us use the technique here in our mozzarella meatball recipe. We sauté onion and garlic together WHILE the bread is soaking to enhance their flavours before mixing them into the meat. Doing this guarantees soft onion pieces with every bite, while infusing the perfect amount of garlic flavour into the meat while baking. You COULD also grate your onion and garlic cloves to save time from sautéing, but we find cooking them yields the best result. Everything gets mixed together in the same bowl as the soaked bread to minimise clean up. You can leave them out if you have doubts, but I suggest following this recipe as closely as possible. Dump your meat mixture onto a baking sheet or oven tray and mould it into a loaf shape yourself, which can take some time to try and achieve even thickness and roundness for even cooking. Bake it in a loaf pan: If you go this option, beware you may have soggy edges instead of crisp edges as the loaf cooks in its own juices. Our preferred method: Mould it in a loaf pan, then turn the loaf out onto a broiler pan (oven grill pan). This way guarantees even cooking and crisp edges. Use a drip pan underneath and save all drippings. If choosing option 3, be sure not to press the loaf too hard into the base of the pan, or you may have a hard time getting it out intact! Mould it just enough to get its shape, then turn it out. So much easier than shaping it yourself! This glaze has the perfect tasty balance. Not too sweet, not too tart with an additional hint of garlic. Half is spread over the loaf before baking, and then half of the remaining sauce is added on during baking, saving the rest for serving with over your pile of mash! Your Meatloaf will need to cook at 400°F (200°C) for 50 minutes. Then, you are going to spread a little more meatloaf sauce over the top and bake for an additional 20 minutes, until the glaze is nice and sticky. 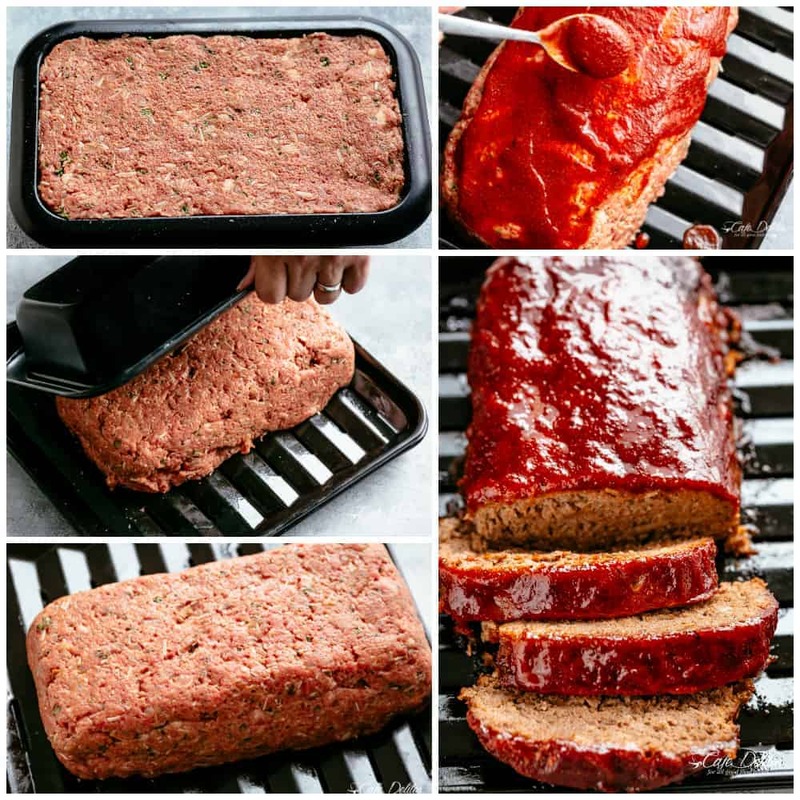 Let your meatloaf rest for 10 minutes before slicing to allow the juices to recirculate back into the meat. If you’re tempted to slice it straight out of the oven, you will find it may fall apart as it is super tender. Tent it with foil while resting to keep it warm. Yes! You can make meatloaf ahead and freeze before cooking. Once the meatloaf mixture has been shaped in your loaf pan, cover loaf pan tightly with plastic wrap and foil and freeze. Defrost raw frozen meatloaf in the refrigerator for 18-24 hours before baking in the oven. OR, freeze AFTER cooking! When cooked, allow to cool completely and freeze in individual slices wrapped in parchment or baking paper to keep them juicy. Place all slices in an airtight container or freezer bag, and reheat slices as you need them! Reheat semi-thawed slices in the oven or microwave. The BEST Meatloaf NOW ON VIDEO! Watch us make it to help you in the kitchen! 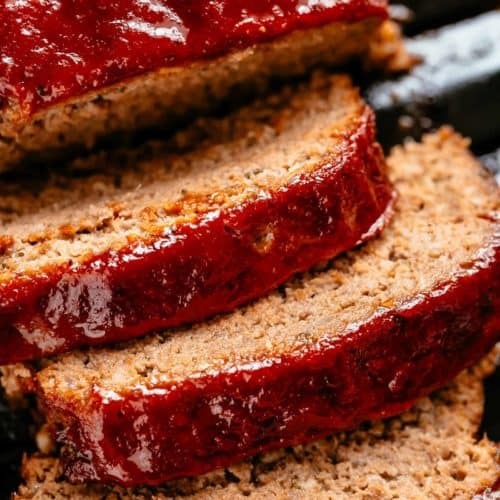 How to make the best tender and juicy Meatloaf with a delicious shiny glaze! Cheap, easy and quick to prepare, let the oven do all the work for you! 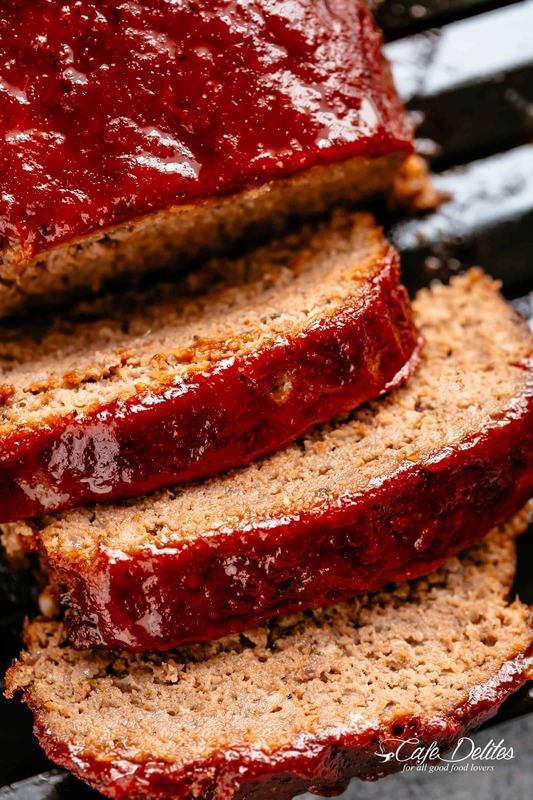 The whole family goes crazy over each slice of this meatloaf recipe. PLUS... take advantage of leftovers and turn them into the best meatloaf sandwiches! Preheat oven to 400°F (or 200°C). Lightly grease a broiler pan (oven grill pan), or regular baking sheet. In a large bowl, soak bread slices in the milk, pressing them down with your fingers. Allow to soak while sautéing the onion. Heat the oil in a small pan over medium heat and sauté the onion until soft and translucent (about 5 minutes). Add the garlic and sauté for a further 30 seconds until fragrant. Set aside and allow to cool slightly. Mash the soaked bread with a fork to break up large pieces. Add in the onion/garlic, beef, parmesan, eggs, parsley, tomato paste, Worcestershire sauce, mustard, salt and pepper. Mix with your hands until everything is just combined (try not to over-mix). Scoop meat mixture into a loaf pan, pressing down lightly to form into a loaf shape. Turn out onto prepared tray. In a smaller bowl, mix together all the ingredients for the glaze. Spread half of the sauce evenly over the top; reserve the renaming sauce for later. Bake the meatloaf for 50 minutes, then spread half of the remaining sauce over the top. Return to the oven and bake for a further 20 minutes. Allow to rest for 10 minutes before slicing. Mix any pan juices with the remaining sauce to serve! Serve with creamy mashed potatoes/cauliflower and/or steamed vegetables. ORIGINALLY POSTED MAY 27, 2018. Delicious! Followed recipe accordingly except only added 1 tablespoon of brown sugar instead of 2 and used one pound ground pork with beef because I had it. .My oven cooks hot so it was over done and was still moist and tasty. This will be my go to recipe when craving comfort food! I loved the meatloaf with one exception. I didn’t like the taste of the cheese. If I leave that out will it cause it not to moist? What is the purpose of the cheese? As always your recipes are “off the chain” and amazing. Thanks for posting mire of your low carb recipes for us Keto followers. Meat loaf has been a favorite all my life. Any suggestions on how to replace the bread? What else can be used in place of bread when making meat loaf? Finely chopped mushrooms can replace bread in a meatloaf recipe. Recipe is very moist and you will never know the bread is missing. This was my first time making meatloaf amazing results I added an extra 1 and 1/2 teaspoon salt and used 1/2 teaspoon cayenne pepper the flavors come together really well. I will be using this recipe for meatloaf always thank you. Im going to halve the recipe, any suggestions on cooking time? It may take 25-30 minutes. What kind of loaf pan did you use in the meatloaf recipe? And broiler pan? Going to make this meatloaf but my husband doesn’t want the sauce on it. Anyone ever try it without the sauce? Thanks for giving this a try. It is really delicious. The sauce is helpful in keeping the moisture in. Thanks for following along with me! This recipe is still making people all over the world happy, thanks from New Zealand! This is almost exactly the same recipe I always make. I have always soaked bread in milk when making meatballs so why not in meatloaf? It really makes a moist meat loaf. I also add diced sautéed celery. Terrific recipe. I have made quite a few meatloaves over a few decades, and this is scrumptious! I couldn’t stop cutting off just one more sliver. Thanks!! Hi! Recipe sounds delicious. My husband can’t have dairy. Do you think I’d get the same moist results if I used broth instead of milk perhaps? Or is there something special about the milk? Jessy, use the brand Lactaid milk. Lactose free milk and most people can’t tell the difference in any dish (mashed potatoes, mac n cheese, etc). My adult son been allergic to dairy since infancy. I always keep plain unsweetened almond milk in my pantry to sub for dairy milk when cooking. I’ve never tried soaking bread crumbs in milk before but will soak them in almond milk and make the meatloaf today with lean ground beef and ground pork. Fingers crossed! Mine didn’t come out! ☹️ The meat was tender but the glaze was so vinegary that my kids wouldn’t eat it. I love vinegar and even I thought it was too much. I followed the recipe exactly, using ACV and American ketchup. What did I do wrong? I spent a long time putting it together and I’m sad I didn’t get the great result that everyone else did. Oh no! I am bummed it did not turn out well for you. I have never had this happen. I am wondering if your altitude is different or if your meat may have absorbed too much oil. I am sad it didn’t turn out okay for you. I like to roast a meatloaf in the pan and use Parchment paper to roll the loaf before I place it in the loaf pan. I then set the parchment paper to lift it out of the pan. It helps make for a firm loaf without a lot of holes in the loaf. I also like to do a tomato and onion gravy as a sauce with the loaf. I am unable to make the “print” button work so I don’t have to use my phone when making the recipe. Was also wondering if you could make your tips and hints a part of the printable recipe. That’s where I rely on your expertise and innovation. I love your website design, it draws my attention to you wonderful recipes. Delicious! First, I found this website because of the menu planning and I like to read recipes. I am and was using the menu for the week and made this meatloaf. Awesome! This will be my go 5o meatloaf recipe. Thank you! Happy Halloween!! I was wondering if you could freeze unbaked smaller portions for future use. That way I could use half the recipe for one dinner, then freeze the rest in two small portions for two for another time. Thankyou for all your great recipes, and also including the nutritional info. It is great as my husband is on a low sodium restriction and this allows me to cook food that adheres to a strict sodium diet but has flavour. I wouldn’t freeze unbaked portions of the meatloaf simply because of all the mixing etc. I would be worried about contamination in the ground beef. That’s only my opinion though. I made your meatloaf tonight and it was wonderful! My husband who looked nothing has changed his mind about meatloaf! Thanks so much for the recipe!! I’d like to try this for a casual company meal, but two of my guests are can’t eat anything from the garlic/onion family. Can you suggest substitutes for these? You can leave them out or substitute them with chives. Can you use 1 lb of ground beef and 1 pound of ground pork? I’ve noticed that when I change the servings to 4 the US system adjusts the weight (from 2 pounds to 0.8), but the European amount doesn’t. It stays at 1 kg. Can that be changed? So thrilled to find your site. No need to search further for the perfect meatloaf!! We LOVED this recipe! My coworkers tasted my left overs and asked for the recipe. Its the perfect consistency and packed with flavor. Can’t wait to keep trying new recipes! Can i use 1/2 pork and 1/2 ground beef? If we dont soak the bread and just want to use bread crumbs what are the measurements for that? The bread makes the meatloaf moist but I would use about 1/2 cup to a cup of bread crumbs. Great to hear! So happy that you loved it and had leftovers to savor the flavor! Thanks for following along with me! Hi Katrina, love love your recipes, never boring and so easy. Just wanted to know if i halve the recipe how long would i cook it for? Look forward to trying more of your tasty meals. You would still cook it for about the same amount. About 30 to 40 minutes checking on it. Hope you enjoy it! What if I used a convection oven instead? Still same time for halved amounts!? My ovens broken so only have a convection oven! The second image took my breath away! The meatloaf looks really juicy and perfectly cooked. I love mine on warm creamy mashed potato. I’d like to give your recipe a try soon. MMM! That does sound delicious! I hope you can try it soon! Hey Karina is it possible to use turkey burger for this recipe? If so what fat percentage and cook time would you recommend ??? MMM! That does sound good! I have not made it with that so I wouldn’t know the exact temperature and timing! Let me know if you happen to make it! Enjoy! Oh wow this was the best meatloaf I’ve ever had and my husband and kids ate it like it was going out of style! Already trying to get it into the rotation – you guys have to try it!! Would this recipe work with gluten free bread? What do I do with the sauted onions and garlic? You will add it in to the meat after it cools. Enjoy your meatloaf. I used to serve a Heinz 57 meatloaf. To the mixture same as described; I added Heinz 57, Mustard, Ketchup and a bit of Lea and Perrins Worcestershire Sauce in with the meat mixture. Great flavor, moistness and flavorful. I am a retired Chef and innovation was always a must. What type of hamburger meat did you use? The last time I attempted a meatloaf I used organic grass fed beef and it was not the right consistency at all for good old fashioned meatloaf. Your recipe looks so good! Hi Judy! I use regular, good old ground beef. 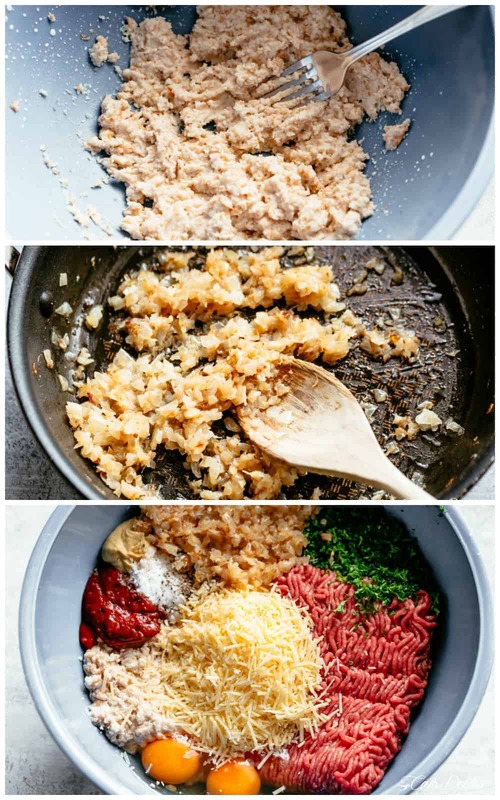 I’ve tried both lean and normal full fat ground beef, and both yield the same yummy result!